When I first saw this recipe from the Olives for Dinner blog for salt-roasted carrot lox that supposedly tasted exactly like smoked salmon, I printed it out, put it in my recipe binder, and ignored it for years. I meant to make it a million times, but what stopped me was the salt. 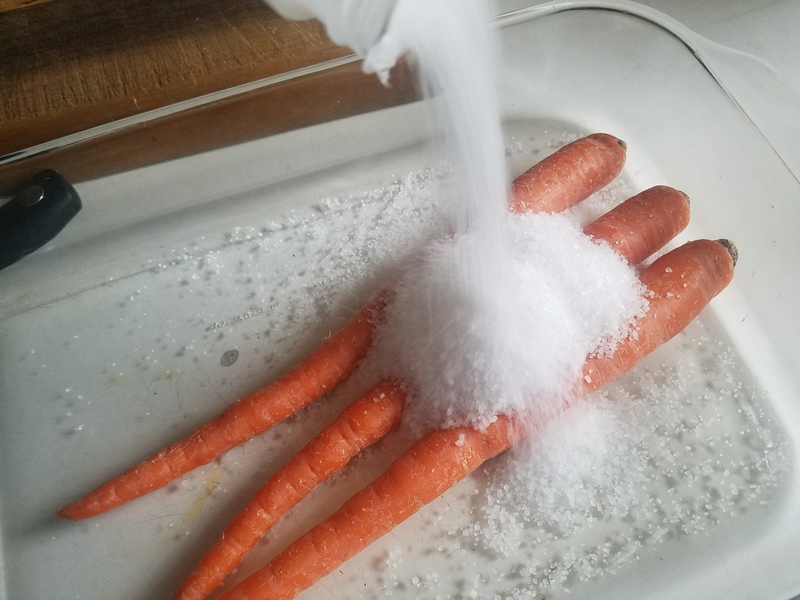 Using two cups of salt to cocoon just three lonely carrots in a cozy salt blanket while they softened and seasoned perfectly in the oven sounded super cool. And then you still have to wait two days to eat it! But seeing the recipe in my binder again, I got a craving for bagels slathered with cream cheese, salty salmon, dotted with sour capers. It gave me the urge to try it again. So I followed the recipe as written and it was divine! Everything a bagel is meant to be. It tastes just as delicious on toast as a bagel! My omni husband tried it and declared it was as good as the real thing (that’s saying a lot!). But I knew when I dumped a giant brown cake of salt in the trash that I didn’t want to do that again. So I started looking into other methods and it turns out that salt roasting was all the rage in the culinary world a few years ago. Which naturally got people wondering if it was worth the trouble, mess, and expense. The salt acts like a blanket to trap in moisture. The same thing will happen with aluminum foil. I tested out the theory for Christmas and, the critics were right! My next batch was every bit as amazing with far less effort. The carrots were perfectly roasted, steamed, and salmon-y soft. You still have to wait a couple days for the flavors to develop marinating in the fridge, but believe me, it’s worth it! The marinade is super simple. 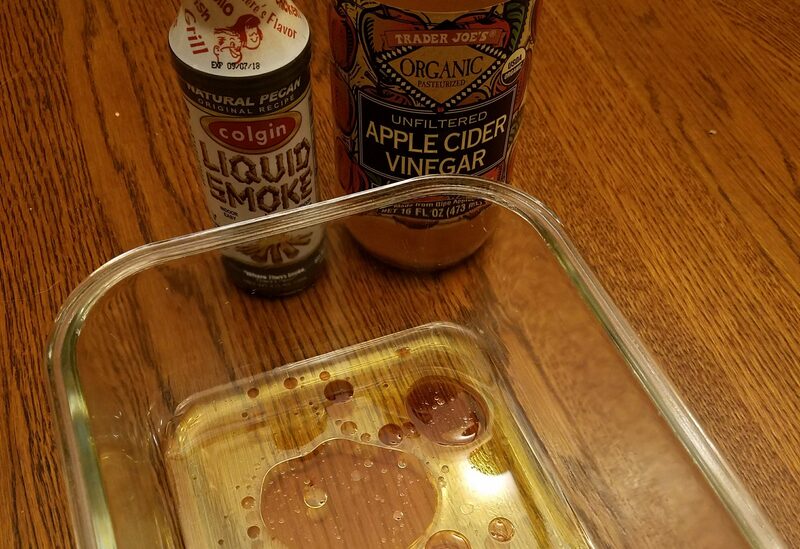 The marinade is three ingredients: olive oil, liquid smoke, and apple cider vinegar. Of course, most people are probably wondering at this point, but what about the cream cheese? Surely that’s not vegan, right? I’ve used store bought vegan cream cheese from Trader Joe’s, which is pretty good, but not nearly as awesome as homemade. It’s really simple to culture your own at home using plain non-dairy yogurt (store bought or homemade) and cashews. And you can control how sour it ends up as you like it. The cream cheese recipe I like the best comes from an awesome vegan cheese making book called This Cheese is Nuts! : Delicious Vegan Cheese at Home (affiliate link) and it uses aquafaba as the liquid and makes the cheese turn out incredibly creamy. 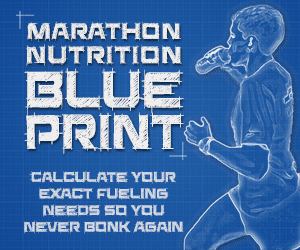 And if you’d prefer to have instant gratification, you can skip the culturing step and just make this version. These carrots turned out so amazing that I can’t believe that I waited this long to make them! Place carrots on a sheet of aluminum foil large enough to create a loose cocoon around them and sprinkle with salt. 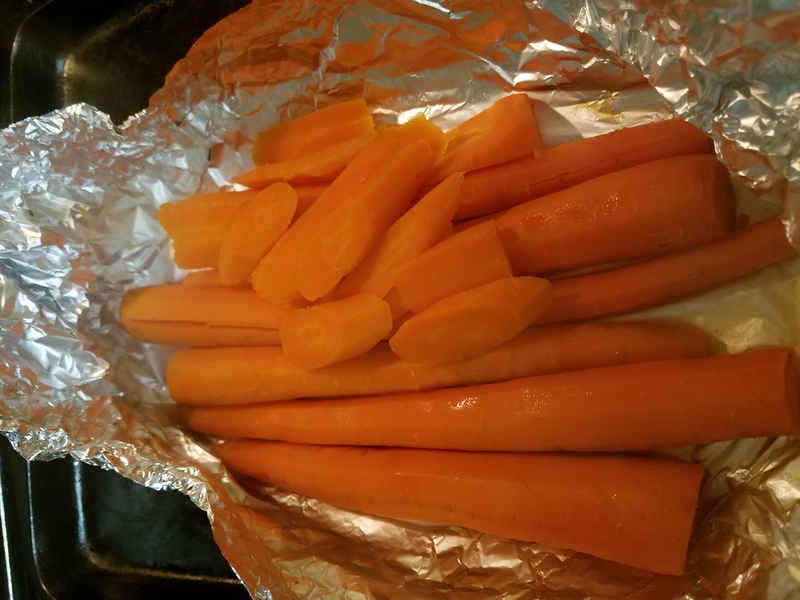 Loosely seal the carrots in their foil cocoon, place on a baking sheet and roast for 45-60 minutes until very soft. When cool enough to handle, slice carrots thinly in slightly irregular shapes to resemble smoked salmon. In a glass dish, mix remaining marinade ingredients and add carrots. Marinade covered in the fridge 24-48 hours. Best flavor and texture is after 48 hours. Check and stir occasionally to be sure the carrots are still coated with marinade. When ready to serve, be sure to bring the carrots back to room temperature so the oil is shiny again. 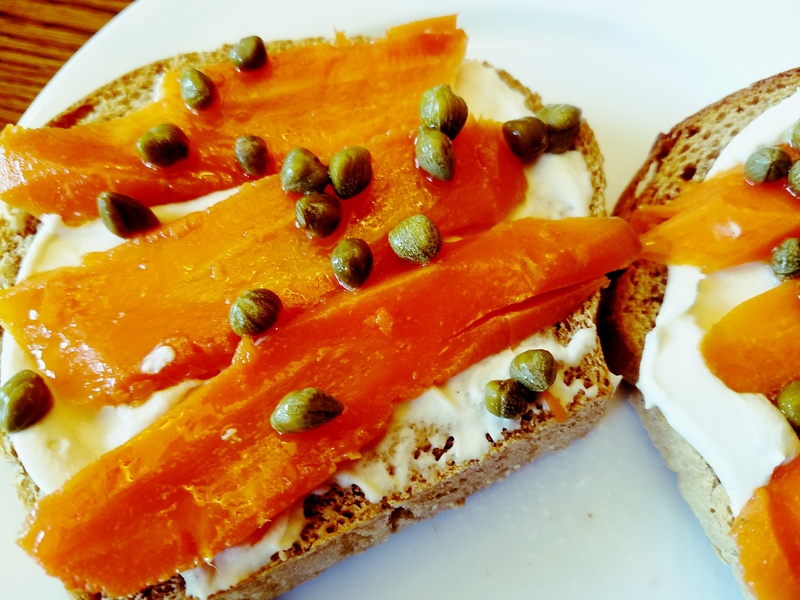 Serve on cream cheese with capers on bagels, toast, or crackers. Will keep refrigerated up to one week. Adapted from Olives for Dinner Carrot Lox.